NEW DIY SERVICE!" As a World leading Major Appliance & Room Air Conditioner Service Company, we are committed to providing you with the Most Professional and Cost Effective Service Solutions...We are Now Offering a New Do-It-Yourself Service that will save you hundreds of dollars on your appliance repairs! 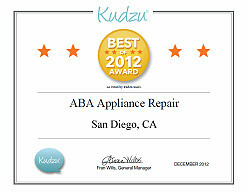 Check out our Ratings on Service Magic, 5 Star Rating with Impeccable References and Reviews, KUDZU with Excellent Ratings & the Brand New Appliance Repair List of San Diego!! ABA is unmatched by any service company in the entire San Diego area, bar none!.. Save Hundreds on your Heating/AC & Appliance repairs! Always & Free Estimates on all Repairs! No Extra Fees - Pay Only Parts, Labor and Tax, the way it is supposed to be! Factory Trained Technicians! Factory Authorized Parts! Unheard of anywhere... Free... Service Call ! ... to any San Diego County location! Now a Household name in Professional, Honest and Affordable Service! "The Only 5 Star Rated Service Company in San Diego County!" 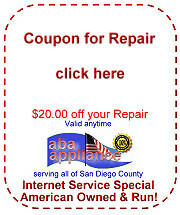 ABA Appliance has over 20+ years experience in the Major Home Appliance Repair Field, and we are dedicated to Bringing Back & Preserving the Quality of Service the customer Deserves, unlike most servicers we are aware of these days. 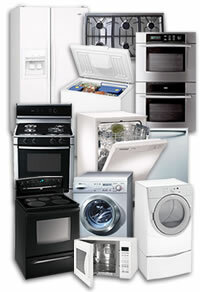 We are committed to bringing you an Prompt & On-time, Courteous, Proficient, and Affordable Service of your major brand appliances, not making you wait weeks for your first visit from our technician, and definitely not making you wait weeks for parts to be ordered to complete your repair, if parts orders are necessary, which in most cases they are not. Our Focus to Customer Satisfaction is a direct result of our dedication to the customer after years of seeing customers treated poorly by other service companies, including the Largest Manufacturers, who routinely make customers wait a week or two weeks just to have a technician come out to diagnose their appliance, and charge large service call rates, just to show up at your door without even touching your appliance. We don't charge you any service call fee, and only believe in you paying for what you called service for, the cost of the part(s), labor and tax. Our dedication is catching on, and we cover the entire San Diego County area. in San Diego County ! Home Advisor Ratings - Excellent!! Comments: The service man was supposed to arrive between 1P and 3P. He arrived exactly at 1PM. He was clean, polite, finished his job within 45 Mins, cost was half of what I had previously paid a couple of years ago for the same type of work. I have already recommended ABA to my daughter and will only use them for future work. Thank you Home Adviser! "I usually use Appliance Rescue but you have a better rating on Kudzu. off your repair bill !! Our prices are cheaper than others, especially because we Never charge you a service call charge, normally others charge you $10 to $110.00 just to show up at your door and do nothing! Our coupon helps you save even more money on your repair. If you find any other service company that gives you a written quote lower than ours, we will match it and also give you an additional $20.00 off! in all of San Diego County! with ABA Appliance Factory Trained Technicians! that need Technical help on a job! click here to get help now! Earn More than any other company will compensate you!